The highly anticipated Finals rematch between the Golden State Warriors and Cleveland Cavaliers has resulted in two Warriors blowouts in the first two games. What many felt could be a long, tight series is increasingly looking like a bleak situation for the Cavaliers, particularly after a 110-77 shellacking in Game 2 Sunday night. That isn’t to write off Cleveland. The Cavs are going back to Cleveland and have to protect home court. They will likely note how they just lost two games to the best regular season team in NBA history on their home court — so what? However, other than home-court advantage, there’s little for the Cavs to be optimistic about going forward. A 2-0 deficit is not insurmountable, but it looks especially daunting against this Warriors team. To win the Finals, the Cavs must now win four of the next five theoretical games against a Warriors team that’s only lost two games in a row once all year — to the Thunder, in the Western Conference Finals. That Thunder team was far more equipped to handle the Warriors and were playing far better than this Cavs team. They had the Warriors against the ropes and still couldn’t eek out a fourth victory. Furthermore, there’s a scary sign for the Cavs: Stephen Curry has been dormant. In two games, Curry has 29 combined points on 11-26 shooting, yet the Warriors have won in convincing fashion both games. While some of Golden State’s role players will likely cool off on the road, Curry is plenty capable of taking over a game in Cleveland. And Curry’s eruptions are far more devastating than, say, 20 points off the bench from Shaun Livingston. As ESPN’s Zach Lowe foreshadowed in the Eastern Conference Finals, the Cavaliers haven’t been playing good defence throughout the playoffs. They managed to get away with doing so against meager opponents like the Pistons, Hawks, and Raptors, but the Warriors are another beast. Through two games, nothing has changed — the Cavs’ defence has been a mess, botching simple rotations, assignments, and communication on switches. 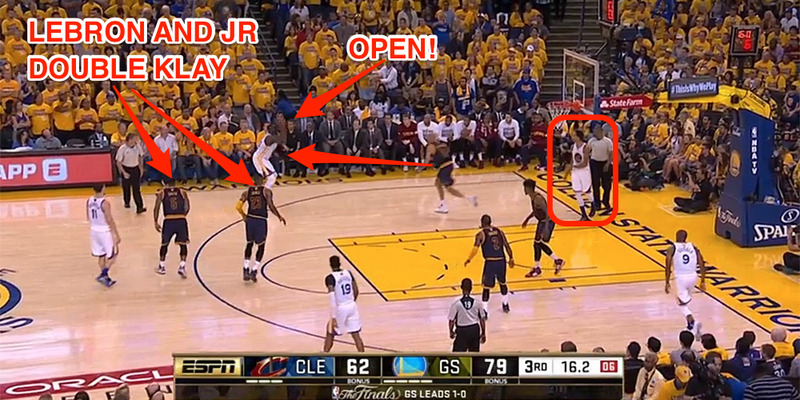 Below, the simple presences of Curry and Klay Thompson warp Cleveland’s defence. Tristan Thompson switches onto Curry, and LeBron James, guarding Andre Iguodala, begins to cheat off of him, anticipating Curry blowing by Thompson to the basket. 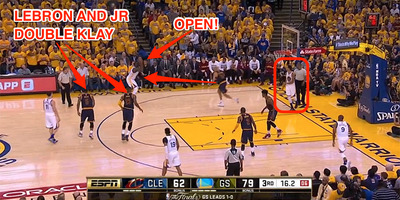 Meanwhile, Thompson cuts along the baseline, dragging Kevin Love off of Andrew Bogut, with J.R. Smith trailing along. That leaves Bogut open, which is ok, as he’s not a threat to hit a jumper. However, as an excellent passer, Bogut can better scan the floor when open. The Warriors are extremely difficult to defend, but an opponent stands no chance when they’re botching basic defensive plans. In the third quarter, the Warriors showed off their beautiful brand of basketball, beginning the play with a simple pick-and-roll. James began the play by drifting way off of Green, for reasons unknown, considering Green was on fire from three-point range in Game 2. When Green sets a pick for Thompson at the top of the key, James is already scrambling to meet him. The Cavs double Thompson to get the ball out of his hands, leaving Green wide open. Instead of taking the open three, Green dumps it to Shaun Livingston down low. James, now on Thompson, abandons Thompson, thinking Livingston is going up for a layup. Instead, Livingston fires a pass back out, beginning a chain reaction of scrambling Cavs that results in a deep, open three for Thompson. On offence, things aren’t much better. James has twice posted gaudy stat lines, but hasn’t be efficient in doing so. 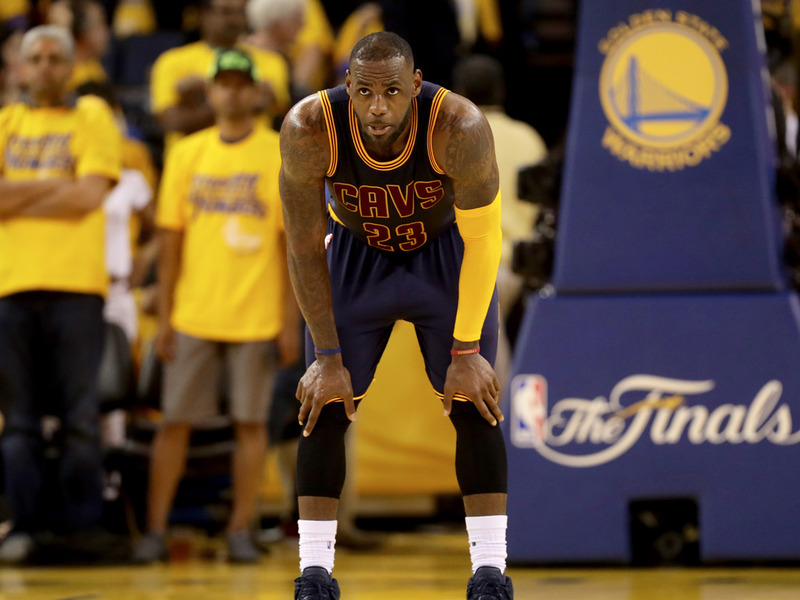 The Warriors are as well-equipped to defend LeBron as any team in the league. 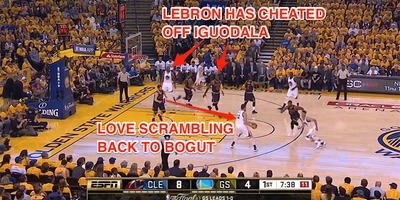 Andre Iguodala is a notorious LeBron pest, winning Finals MVP last year in part for his defence on James. And with so many long-limbed, similar-sized defenders, the Warriors switch everything, meaning James is often rotating from one 6-foot-7 defender with long arms to the next. James can bully any defender to the basket or take them off the dribble, but he often eats up precious seconds on the clock to do so. In the meantime, the Cavs stand around and watch him. The Cavs have been posting up frequently to try to take advantage of the size advantage the Warriors give up when switching. The problem is, the Cavs aren’t a post-up team. In the playoffs, the Cavs are scoring just .88 points per possession (ppp) on post-ups, about the same as what they averaged in the regular season, according to NBA.com/Stats. Against such a stingy defence like the Warriors, the Cavs can’t afford to stall out their offence with plays that aren’t resulting in points all that often. In essence, the Cavs are forcing these post-ups despite post-ups not being part of their offensive DNA. In the regular season, post-ups accounted for just 8% of Cleveland’s offence — 11th most in the NBA. To ask a team to switch and dominate in the post on the fly is an ill-advised game plan from Cavs coach Tyronn Lue. Lue has also reportedly insisted that the Cavs try to push the pace and run with the Warriors. It’s questionable whether the Cavs have the personnel to run-and-gun with the Warriors, but they also haven’t shown the discipline to run with the Warriors. Watch below as nobody stops Thompson with the ball or Livingston from prancing to the basket. For a coach who wants his team to run with the Warriors, after the game, Lue sounded flummoxed by their quickness and athleticism. Thus far, it’s clear what isn’t working for the Cavs; now the question is whether Lue can fix these problems on the fly. Furthermore, will those adjustments be enough to beat a Warriors team that perhaps hasn’t even given Cleveland their best shot, with a Steph eruption still pending? From what we’ve seen so far, things look bleak for Cleveland.